The form most commonly recorded is ‘Annetts’ and its 767 appearances account for 54.98% of total entries; the second most common form is ‘Annett’ and its 518 entries amount to 37.1% of the total. The next most common form is ‘Annets’ and its mere 49 entries account for only 3.5% of entries. All the other forms of the name thus only amount to the remaining 4.42% of the 1,395 entries. The fourth most frequent form, ‘Annet’, was recorded 24 times whilst there were only 19 instances of ‘Annette’. ‘Annoot’ appears just six times whilst other forms have but one or two mentions each. Telephone directories are another useful source of information on both forms of the name and its broad geographical distribution. Thus at the present day the name ‘Annett’ is most commonly found within the Greater London area whilst in the provinces there is a large concentration in N. Ireland; otherwise there is a random spread with pockets in several parts of the country. The communities in N.lreland are the present day representatives of a clan found almost exclusively within the parish of Kilkeen in the barony of Mourne a century and more ago. In that coastal area in the shadow of the mountains no less than one fifteenth of all the voters bore the name ‘Annett’. Today its descendants are numerous in America and the Antipodes whilst there must also be a certain number on mainland Britain. On the other hand the name ‘Annetts’ is most usually found in southern England with a high concentration in Hampshire, Wiltshire and Berkshire. The directories also suggest that other versions of the name are currently held by very few indeed. Some versions of the name recorded in the registers of The Office of Population may certainly be attributed to error and uncertainty- as well as personal idiosyncrasy- rather than to separate and distinct forms. Thus the registration of George Frederick Annett in 1891 was made as ‘Annette’ simply because the information was given by a hospital nurse and not the parent. There are several cases of births being registered in two versions whilst a single family would sometimes register births in different forms. This is to be expected from a period when spelling was not quite so widely standardised with ordinary people as it is now. What is noteworthy is that despite the variations encountered in the 19th century, anomalies in registration and a variety of origins there are now virtually two forms only, ‘Annett’ and ‘Annetts’. The standard references on the emergence of surnames in England suggest that in early medieval times, ‘Annott’, ‘Annotson’, ‘Annett’, ‘Annette’, came into use as diminutives for ‘the son of Anne’. Furthermore they point to this as being a name popular on the north-east coast of England, an area, too, where the common gull was also called ‘Annet’. One cannot think the latter at all relevant; however, it is in northern England that early references to the name appear most frequently; as far that is, as research at the present day shows. Thus a manorial court roll of Wakefield, Yorks, listed a Robert Anot in 1275. In 1327 a subsidy roll of Cambridge named a John Anot. 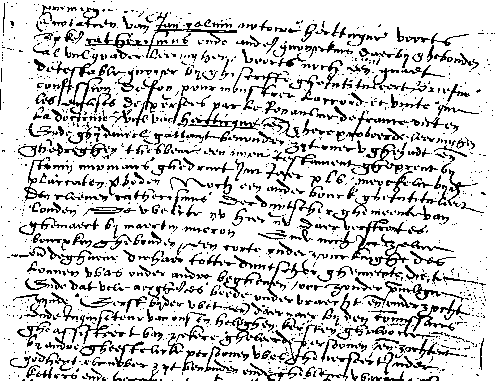 One Thomas Annot was named in a manorial record of Sheffield in 1357 whilst a Yorkshire poll tax for 1379 listed Johannes Anot and an Annotson. 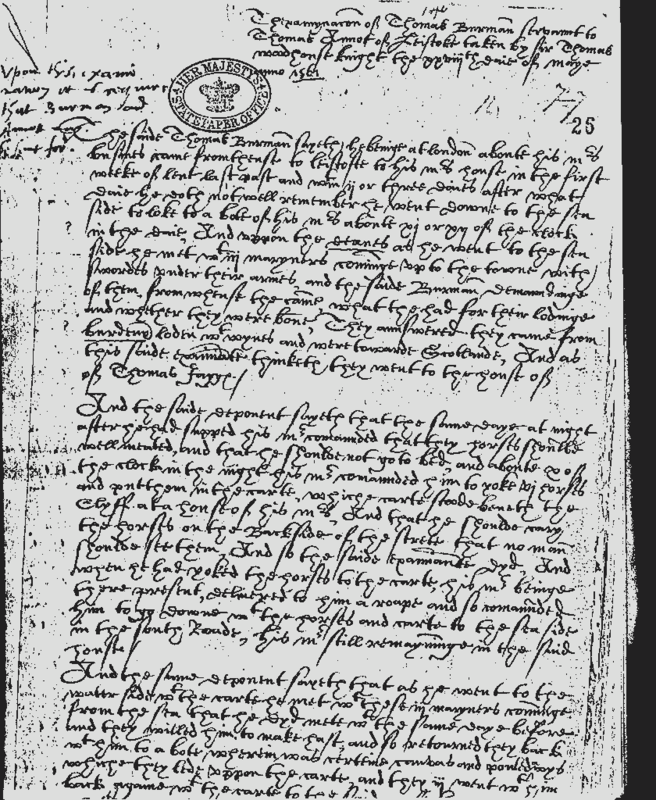 A Thomas Annotson was named in a Pardons Roll of 1393. It is possible that a thorough search of other like contemporary material might yield more examples. In southern England the records of the Corporation of Rye show a John Anite as a witness to a grant of land in the parish of Pesemersch in 1366. But other records of medieval times have yet to be thoroughly searched: however there was not a single mention of the name in the Lay Subsidy Roll for Devon in the year 1332. Neither was there within the Wiltshire manor of Collingbourne Ducis, which place later supported a thriving family named ‘Annetts’. It must be remembered though that to appear on such a subsidy roll people had to possess enough wealth or goods to be liable for assessment. Many folk lived out their lives without ever amassing enough or earning wages enough to be bothered by the tax collectors and so went unrecorded. Thus in Collingbourne Ducis the roll of 1332 named only nineteen people, each paying between 18d. and the 13s.4d. paid by Henry, Duke of Lancaster. Thus there must have been many passed over. As far as the emergence of the name in southern England is concerned it is very noticeable that when parish records become available they point to a concentration of the name in the area surrounding the Hampshire River Ann and that the ‘Annetts’ version eclipsed all others. An examination of printed poll tax lists for the 14th and 15th centuries, the lay subsidy of 1524/25, the ecclesiastical census of 1563 and muster rolls of around the same period for all areas where the names have an early appearance, would be a worthy and probably fruitful task. It is in the 16th century with its proliferation of written records that the name, like any other, may be found more frequently and thus family groups provisionally constructed. Mainly this is due to the injunction issued by Thomas Cromwell in 1538 for all parishes to keep a written record of the burials, baptisms and marriages that occurred within them. At first notes were made on loose sheets copied up in bulk from rough notes. Later methods, including binding the old leaves, improved accuracy and completeness so that the parish registers came to record the major events in the lives of the vast majority of the population with no distinction as to wealth or class. After the vicissitudes of time not all parishes possess a complete record dating from 1538, but most have registers that go back to that century. Even foreign nationals who entered the country and who were allowed to set up their own churches kept records, although the life span of the congregation limited these and put their eventual safety at risk. Some of the owners of the name who appear in the early years of parish records were obviously descendants of natives not previously recorded and some of their lineal descendants must be alive today. Several modern ‘Annett’ families, however, many of whom have had no discernible point of contact, retain a strong legend of having received their name from foreign immigrants who once sought shelter in this country. Some of these legends point to Huguenot families who fled from France at the time of the Revocation of the Edict of Nantes in 1685, an edict which had for a period guaranteed a limited freedom of worship to Protestants in that country. One particular family recalled their forbears having landed in Kent and then having farmed. for a period at Seal, near Sevenoaks in Kent. The Massacre of St. Bartholomew in 1572 was also held to be a reason for families to have fled to this country. The details may differ from family to family, and may indeed be correct, but what is certain is that several present day ‘Annett’ families do derive their name from a continental source. However, immigration from the continent took place in several well marked waves at various times and for various reasons; religious persecution, favourable economic opportunities in this country and even direct recruitment for specific craft skills. Large-scale immigration of foreign Protestants through religious wars and repression on the continent began in the reign of Edward VI (1541-15~3) and would seem to have been chiefly to London. On 24th July 1550, by Royal Charter, the king allowed the formation of a church by the refugees in Austin Friars, Broad Street, “to have their service in and for avoiding all sects of Anabaptists and the like”. It is interesting that the arrival in this country of two Annot (for such is the contemporary spelling -typical of that used by Low Country immigrants) brothers in: 1555 only just pre-dates records of one other with the same surname. In 1556 a Thomas Annot married Agnes Jetter in the town of Norwich: significantly this was an area where a considerable number, of refugees from “the Low Countries had gathered, established themselves in trade and business and revitalised the local, economy, bringing wealth to newcomer and native alike. A second influx of Dutch, Walloon and Flemish people into the eastern parts of England very early in the reign of Elizabeth I (1558-1603) was the result of Spanish religious persecution in the Netherlands and thus the direct cause of the old established cloth trade entering upon a period of great prosperity. The foreign refugees, many of them very skilled workers in types of cloth new to this country, formed strong communities in the townships of Norfolk, Suffolk, Essex and Kent. The records of these counties are full of references to the newcomers and how their arrival brought problems as well as trade to their adopted homes. Quite large contingents of immigrants landed in Kent and settled in Canterbury, Maidstone and Sandwich; at this latter place a Royal Warrant of 1561 empowered the commonalty to permit foreign craftsmen, who were (wrote the Queen) ‘very skilful’, to carry on their manufacture of bays and says in the town. In Essex eleven families found their way to Colchester in 1568; within three years this number had increased to 51 Dutch families numbering 185 people. By 1573 this total had risen to 534 persons whilst by 1586 it was no less than 1,293. At the same time and from the year 1572 a few French Huguenots had found their way to the same county, though mostly to Maldon and Thorpe-le-Soken. At the latter place there existed a separate church congregation until 1732. Among the Dutch families of Colchester there were several who bore a form of the name ‘Annett’. In 1590 there a general muster of men who might bear arms was held and recorded in the lists was, ‘Dutchmen in North Ward mainly Baymakers and Gardeners’, Jacob Annotte, James Annote,” weaver; Phelype Annote, a glasser and John Anoote. A Jaoob Anoote of Saint Giles parish had to pay 8d towards the Lay Subsidy taken in the same town in 1591/98, whilst in 1599 a Jacques Annoot was named as being an elder of the Dutch church. At the Lay Subsidy of 1581 Jeames Hannott of St. Mary’s parish in Norwich was also assessed to pay 8d. These records show the arrival in this country of immigrants from the Low Countries who bore a. form of the name close to one of those of the present. The spelling of the name with letter ’0′ as the second vowel.is typical of references from this period of the l6th century and the refugees in this eastern part of the country.. These were referred to in local records as either ‘Dutch’, ‘Walloons’ or ‘Flemings’ , although at times they were all embraced within the term, ‘Strangers’. Once in this country the immigrants tended to keep together for mutual support and advancement; welcomed by some for their industry and talents, their residence in previously struggling communities was not always appreciated by native competitors or under-employed craftsmen. Generally the newcomers, through the virtues of hard work, business acumen and adaptability as much as a desire not to outwear their welcome, did well, both financially and in other ways, principally in the cloth industry with the new types of cloth they introduced but also in such other ways such as market gardening. At times their success excited the jealousy of established business men and workers and their activities were subjected to trade and tax restraints levied discriminatorily by local burgesses. But not all the newcomers could be described in laudatory terms; there must have been amongst them some of fewer scruples if not positive criminal tendencies. Times were then such that on the eastern seaboard of England trade of another sort was rife and engaged in at the same time as legitimate business. This trade was piracy. Seamen of all nationalities suffered considerably during the l6th century from pirates and privateers operating in the Channel and seas off the coasts of the Low Countries, France and Spain. Spanish merchants were particularly vocal in their condemnation of English seamen who switched roles from legitimate traders to barefaced robbers as opportunity afforded. The nature of the cargo mattered little and however mixed it would be transferred at sea then run into ports where there were enough merchants who asked no questions, or who were in fact the prime movers. Thomas Annet of Lowestoft was one such receiver of stolen goods whose dealings on one occasion were brought to the attention of the authorities. From the evidence given in 1561 Thomas was a man of some means although there was no indication of his nationality. However he did live in an area which supported many immigrants so it is possible that he was once numbered amongst them. Is it possible that he was that same Thomas who had married Agnes Jetter in Norwich in 1556 ? But whoever Annet’s forebears it was as a result of certain Span1sh merchants compla1nlng to the Privy Counci1 in 1561 of the piracy of divers cargoes from several of their ships that one Thomas Burman, a servant of Annet’s, was taken and questioned about the affair. Apparently hides and wine, red alum and linen, haberdashery and various kinds of’ sail canvas had been removed from the holds of several vessels sailing through the Channel and carried off into English ports. One deposition named some of those responsible and charged Thomas Annet with receiving the stolen goods. This piracy. whilst frequently condoned by the authorities in private, brought about periodic attempts to clean up the situation both at sea and on shore. Despite the replacement of’ corrupt officials in the ports and the appointment of special commissioners and the like, little impression was ever made on the practitioners, either English or Continental. This case would seem to have failed to bring anyone to justice in spite of the fact that Thomas Burman told all. He gave a long and convincingly detailed story of events at Lowestoft, in the process incriminating his master Thomas Annet beyond any doubt at all. Burman spoke of the goods being landed, of their collection at dead of night, of their delivery to a house of his master, of how the latter paid, of the involvement of his master’s son-in-law and also how his master tried to ensure his, Burman’s, silence by bribery and by proposing to send him out of the country. The Spanish merchants described Thomas as ‘a very substantial rich man’ and it seems likely from the absence of further records in the State Papers that he escaped any great penalty for his crimes. An investigation into the records of Lowestoft might yield more information about him, his house, family and business. Whilst the parish registers are extant from 1561 there might also be other types of borough and parish records wherein Thomas might figure. Just a few years after the exploits of Thomas, England received its third and greatest wave of immigrants into its eastern and southern ports and havens. They came as a result of an even greater outbreak of religious persecution instituted by the Duke of Alva shortly after his arrival in the Spanish Netherlands in 1567. Many Protestants fled the Low Countries despite attempts by the Spaniards to close the continental channel ports. Once in England these people helped swell communities established some years before in such towns as Canterbury, Norwich, Sandwich, Colchester, Maidstone and Southampton. If they brought little immediate wealth yet they brought their skills and their skills and expertise in all manner of trades and business; manufacturers of woollen goods, linen and silk, weavers, dyers, cloth-pressers, silk-throwsters and many others filled and began a revival of previously decaying English towns. It is from this period of immigration that holders of the family name begin to figure more frequently in parish registers. This is most noticeable in the main immigration areas nearest the continent, whilst the name is most commonly rendered as ‘Annott’. In addition to the English registers for some of these towns there are also the records of the churches for the foreigners; those of the Walloon Church at Canterbury name Jacobe Annote in 1590 and Charles Annot in 1603. This may mean that one of the families was a French speaking one from Flanders for there were no fewer than 900 such immigrants in the city by 1645 and 500 at Sandwich. Certainly there must have been several families of the name in Canterbury at the turn of the century, for the registers of the English churches of St. George, St. Andrew and St. Mary Bredin record family events which strongly suggest certain groupings, or tables of descent. The registers of the two latter parishes have yet to be searched systematically whilst those of the other thirteen have also yet to be seen. At least the families found in the registers of St. George were of some small consequence in the city and one, at least, seems to have had an interesting career. This was Charles Annott, a surgeon: admitted as a freeman of the city through purchase in 1599, a status then conferred on his two sons-in-law who were of the same profession, his life is commemorated by a monument on the walls of the church of St. Andrew. All that is left is a partial inscription, “Caroli Annott 1632 Englishe Fleete …88 Spanish Fleete”, set above a pictorial representation of two battle fleets. One is left to conjecture at the part that the Spanish Armada played in Charles’ life; obviously it was a major event that it should be so shown on his monument. Whether it was the same Charles who put his signature ‘Charles Annoott’ in the records of the parish of St. George, where he appears. to have been a churchwarden, is another point for elucidation. But the immigrants of the south and east are not the only name-holders whose appearance and antecedents are difficult to determine after the passage of centuries for there are other instances in areas far from the coasts. By the year 1559, for instance, the name had become attached to a small piece of land in Surrey: in that year Elizabeth Copley of Carshalton died. .Her lands and holdings were listed in an inquisition port mortem and amongst ten acres of meadow in Carshalton and Wallington, a small parcel, a meadow, was known as ‘Annot Lande’. It is more than likely that the land received its name from that of a man with whom it was once particularly associated, but was he of a native family or an early immigrant as the typical Dutch spelling might suggest? . In 1594, John Charge of Wavenden, Bucks, died and left a bequest of 10s. to be used in the repair of ‘Annot Lane’. Thus it is very probable that there was a family connected with the county well before these marriage registrations, the only records so far examined:- . 1688 William Annutt married Mary Weatherhead at Little Miissenden. The earlier connection is further suggested by the fact that in the parish of Langley Marish the name ‘Annette’ was in use as a place name by the middle of the 17th century. At the same time the name was being used in a similar capacity in an area even further from the south and east coasts; in Feckenham, Worcestershire, ‘Annett’s Place was named in some Chancery proceedings. It is, however, when one moves on to the heart-lands of old Wessex that the name-holders are found in even greater numbers, albeit with the vast majority of cases showing the form ‘Annetts’, the final ‘s’ not being found in the immigrant areas. In 1545, some years earlier than the first wave of immigrants and far from any port or haven, William Annettes paid 10s. tax at Burton and Eston in the Hundred of Potterne and Cannynges, Wiltshire. In 1562, John Annattes, of Bysshoppes Cannynges, Wilts, paid a fine of 3d. to the Guild Steward of the Borough of Calne; twelve years later a John Annattes married Maria Kite at Weyhill in Hampshire. Thus appeared in Wessex versions of that form of the name destined to be most .common in modern times. Just fourteen miles away from the homes of William and John another William Annates died at Collingbourne Ducis, Wilts, in1631, whilst a John Annets died at Marten, five miles away, in 1631/32. The earlier dates would seem to indicate that here were no immigrants but native families with roots going back to earlier times. An investigation of the registers of Collingbourne Ducis and its close neighbour, Collingbourne Kingston, both of which are extant from1653, revealed the members of successive generations of William’s family and linked them firmly with their descendants of today. Most still spell their name as ‘Annetts’ but just a few have unaccountably dropped that final ‘s’ in the last two or three generations only. Both William and John were described as ‘husbandman’ in the inventories of their belongings made in consequence of their each making a will. William’s belongings totalled £36; one of the appraisors of his goods being an Edward Annats, undoubtedly a close relative. John was in rather better circumstances for his inventory, which listed goods, chattels, crops and animals valued all at £60. others of the name were in different trades and callings; John Anniott was an alehouse keeper at Odestoke, Wilts in 1620, in which year he subscribed to the’ Wilts Lenten Recognisances’; at Hook, Hampshire, in 1636, Thomas Annotts, a brickmaker, and his wife Ann had their daughter Mary baptised. A few years before, in 1621, William and Elizabeth Annits were living within the parish of Odiham, Hants. all of whom were married in Salisbury. Again the registers of the town need to be completely checked in order to reconstruct some of the families who then lived there. Further south, on the way to Southampton, an Amy Annett died at Wellow in 1640; she left a son, Robert and daughter, Amy. Robert and his wife, Avis, continued to live in Wellow and for many years before his death in 1675 he was a churchwarden. Further north in the same county, Mary Annetts died in Kimpton in the year 1680; she left five sons and a daughter as well as two grandchildren. At Burghclere, nearer Newbury, a Mary Annett died in 1673. Throughout the first three-quarters of the 17th. century the family name was being spread and carried on, both by native English lines as well as by continental immigrants who entered the country at various times after 1550. By the early years of the reign of James I, immigration slowed to a trickle for conditions on the continent had changed: in France a degree of toleration had been won by the Protestants through the terms of the Edict of Nantes in 1598. The Dutch began to reap the rewards of independence from Spain after 1609, when a twelve years truce was signed at Antwerp. These happier times lasted until Louis XIV revoked the Edict of Nantes in 1685, thus bringing to an end the freedom from religious persecution which the Protestants had then enjoyed for nearly ninety years. But up to that time the first immigrants took root in their new homeland, either striking out and quickly becoming absorbed into English society, or entrenching themselves for a while into well knit refugee communities which endeavoured to retain the habits and practices of past days. Some of these immigrant families are recorded in the records of the congregations of the foreign churches; thus before 1685 French churches existed in quite a number of English towns; Canterbury, Canvey Island, Colchester, Dover, Faversham, Glastonbury, Ipswich, Maidstone, Norwich, Rye, Sandtoft, Sandwich, Sou.thampton, Stamford, Thetford, Thorne Abbey, Whittlesea, Winchester and Yarmouth. The registers of the ‘Walloon’ or ‘Strangers’ Church, Canterbury (previously noted for early references to ‘Annot’s') record several versions of the name. In 1638 they note a Nicholas Hannet and Pieronne, his wife; then in 1691, the then late Samuel Hannot is referred to as a native of Guienne, in the pays Conquis of France. Other references show that Jeanne Hannot, daughter of Samuel, was looked on as a native of Canterbury; however, she married another Frenchman, Jean Delmaire, a native of Picardy. In Colchester, the registers of the Dutch church refer to a family named Annoot, for there on September 20th. I660, Maria, daughter of Jacob and Maeyken Annoot, was baptised. Some years later, in I694, John and Susan Annett registered the baptism of their son, John, in the Quaker Church of that same town. In 1673 two different members of the Clockmakers Company in London took an apprentice each; one of these was a Nicholas Annat, the other a Charles Annott. In the far Westcountry Richard Annett was contracted by the Navy in I693 to build ropehouses, store-houses and thirteen officers’ residences at the royal dockyard lately constructed at Point Froward, Plymouth. But by that year there had been another wave of immigrants from France, occasioned by renewed religious persecution of the adherents of the Reformed Church. Many of these French people, Huguenots, left for England; a great number far outdistanced their Catholic fellow citizens in commerce, marine adventure, industry and technical skills and this knowledge, this energy, they brought to the more congenial soil of England or even the New World. With these refugees came more bearing versions of the family name, frequently now with an initial aspirate; however, as this was not sounded in French the result was close to versions already in vogue. In the provinces further French churches came into being in such places as Barnstaple, Bideford, Bristol, Chelsea, Dartmouth, Exeter, Greenwich, Hammersmith, Plymouth, Stoneham and Thorpe. In London, the most popular settling place, there were no fewer than sixteen Huguenot churches in and around the area of Spitalfields and a seventeenth in Wapping. This is not a surprising number when one remembers that the church was central to their existence and the very reason for their arrival. Estimates as to how many Huguenots came to England vary from between forty to one hundred thousand: they entered the country in three main waves, the first in.I68I-82, the second, and largest, between 1686-88 and the third between 1698-1700. They met with a great deal of warmth and sympathy, both royal and public, and were soon prospering as cutlers, watchmakers, instrument makers, jewellers, opticians, locksmiths, hatters, glovers, goldsmiths, silversmiths, surgeons, tailors, all kinds of luxury trades but -above all -in every branch of the silk industry. The main settlement area for the refugees was Spitalfields, London, for there the silk industry had been established for fifty years. The more prosperous built elegant homes in Spital Square but the working class crowded into long rows of houses in cramped narrow streets which were quickly run up to house them, thus covering the fields and gardens the area that had been there before. It is probable that there were over fifteen thousand in this neighbourhood; certainly they soon spread into nearby Bethnal Green, However, this very act, though it helped many to continue to live in a fairly compact colony, made it difficult for them to remain distinct from their English neighbours and thus their way of life soon began to change. Even in Spitalfields there was a great variety of occupation amongst the newcomers. Church entries from 1689 to 1716 enumerate 59 trades within 679 persons: no less than 53 were connected with the sea; this is not surprising when many of the immigrants came from the coasts of Normandy, the shores of Brittany and the Bay of Biscay. Still others gravitated to the west- end of London and they were those in the more skilled luxury trades and professions. Many were shopkeepers selling the very goods they made; others attended to the needs of the residential population, some engaged in ‘personal service’, a number held military rank; very few were connected in any way with textiles. One group settled in Wandsworth where they established many important industries that brought much prosperity to the town. It was in gratitude that a memorial to the exiles was erected in the small burial ground of Mount Nod. A small Huguenot settlement developed in the village of Sunbury by 1703 and by 1709 twenty- four of the parishioners assessed to pay poor relief were French. Their names recur in local records at least until 1748, though possibly some remain until the19th. century. French Street, Sunbury, remains to remind one of the colony’s existence. The children of Etienne Hanet and his wife Elizabeth were baptised at the French Church of Hungerford Market; Etienne in 1720 and Gabriel in 1722. In the Church of Threadneedle Street other ‘Anet’s’ of Paris were married, whilst Magdeleine Hanet who married a Guillaume Benoist had her children baptised at the French Church in Rider Court. A David Hanot was a witness to a baptism at the church of ‘La Patente’, Spitalfields, while several other families, ‘Hanote’ or ‘Hanotte’ are recorded at the French Church in Thorney, Cambridgeshire, between 1682 and 1727. A record of interest in view of the later distribution of the name in Ireland is in the register of the church of St. Patrick and St. Mary, Dublin, where Marguerite Hannat was godmother to Ester Pineau at her baptism in 1711. At least two of the Huguenot refugees went to the trouble and expense of being naturalised by Royal Letters Patent; they were Peter Annaut in 1682 and John Hanet in 1686. Like the latter, the great majority of those recorded in the various Huguenot registers bore the name with an initial aspirate. As this was not sounded it would have been pronounced little differently from other versions; French records show that it was frequently written without the initial ‘h’ and a few years in England at a period when spelling was still inconsistent would no doubt have accelerated the change in form. The aspirated form did appear at least once in England well before the Huguenot immigration, however; this was in Plymouth in 1606 when a John Hannet was regularly employed by the borough as a mason on the rebuilding of the Guildhall and Shambles. All kinds of records, public and private, chronicle the advent of the Huguenots and chart their path towards integration into English society; a society that at the time of their arrival was in many ways well behind that which they had renounced in France. Their coming and stay did much to reverse this situation for they had a great deal to offer the social, professional and business life of the country. Catherine’Hanet, the Parisian refugee of 1686, was the widow of a clockmaker and in this country the firm of Hanet became famous in this field. John and George Hanet registered as clockmakers in Westminster in 1765 and in Newport Street in 1770 and 1775. In 1765 Jean Hanet was Director of the French Hospital, La Providenoe, in London. In the very early years of the century, 1705, Paul Hanet was in business as a goldsmith; his marks were entered with the Goldsmith’s Company in 1715, 1717 and 1721. From Spitalfields, weavers, both masters and men, spread into Bethnal Green; Soho became a stronghold of the immigrants who made large. contribution to that foreign flavour the area retains to the present day; Wandsworth also owed them much as did many other areas of the capital. One such centre for followers of the ‘Religion Pretendue Reformee’ was Guisnes in north eastern France. Once the scene of the ‘Field of the Cloth of Gold’, there freedom of worship had been permitted, a Temple established and registers kept. These are now held in the Griffe Civil at Boulogne-sur-mer. Between the years 1668 and 1685 the names Hanotte, Hannot, Hannotte, etc., are recorded and several of the families may be traced to England. Some examples that may be Reconstituted with some confidence follow are demonstrated in an appendix. As northern France and the Low Countries were the areas of origin of so many continental holders of the family name between 1550 and 1685 it might be assumed that here indeed were the homelands that bred them all. After all, in Normandy, just 40 miles west of Paris, lies Anet with its chateau built by Philibert de L’Orme between 1547 and 1552 for Diane de Poitiers, mistress of Henry II. The building, largely destroyed during the French Revolution, is recognised as that most influential architect’s masterpiece and a source of inspiration for many later builders and buildings. Its frontispiece was removed to Paris to grace the ‘Ecole des Beaux-Arts’ whilst the ‘Diana of Anet’ went to the Louvre. The present owners of the chateau, M. et Mme. de Yturbe, aver that the town and chateau took their name from the Latin ‘alnetum’; ie. the place where trees known as ‘aulne’ grow. Some of these trees still do grow in the park to this day. From ‘alnetum’ the name changed to ‘Ennet’, then in the 16th century to ‘Annet’ and then ‘Anet’. Then to the east of Paris there is Annette-sur-Marne, whilst south-east of Digne, in Provence, there is Annot. The late Stephen Frederick Annett conducted a particular investigation into these possibilities as his correspondence shows, but concluded that none of them bestowed their name upon the family. Members of the family descended from Rolphe of Northumberland returned in the 19th century to the Montelimar region of France to live and work; some are still resident in Aix-en-Provence to this day. This family was quite sure that there were none others of the name in Provence. This same branch of the family did, however, retain and firmly believe in the tradition that they once belonged to Lombardy, where they were silk weavers, of leaving that area for Lyons, another silk centre and remaining there before once again moving on to the journeys that were to take them to England. Furthermore they believed that in Italy the name had been ‘Annetti’, and this could quite possibly be true. When the Duchy of Milan, which included the plain of Lombardy, was overrun by Spain in the early l6th century, its inhabitants were at once subjected to the harsh offices of the Inquisition. Many of the numerous resident Protestant families then fled Lombardy for France in order to escape the persecutions and confiscation’s ordered by Cardinal Caraffa, who was determined to root out and destroy all heretics regardless of their skills or standing. France, until later events were to fill this country too with the discord of religious strife, was a haven for these Italian families. Naturally they went not only to places where they would be free to worship but also to where they would best be able to practise their trade, business or profession. Silk weavers went to Lyons and helped the industry attain .the high standards for which it became famous. Unfortunately many of that city’s records and archive materials were lost during the revolution: this prevented the modern family from finding any trace of its earlier antecedents. This explanation of the origin of his own ‘Annett’ family fully satisfied Stephen Frederick Annett although it was one of his great disappointments that cost, then the war of 1939-1945, prevented him from obtaining from ‘Araldica’ of Rome a genealogical reconstruction of the ‘Annetti’ which might prove his theses. However, a study of the correspondence leads this member of the Annett’s to believe that the Italians were offering an heraldic device rather than a family tree. This correspondence also makes clear the extent of Stephen’s investigations and the number of clues he tried to follow up. One such led him to write to several authorities of the day regarding Anet Island in the Scillies. Upon being told of this small isle he perforce followed it up only to find that there seemed to be no family connection with it. That the name was fixed at quite an early date is shown from the fact that in 1301 the lord of the isle of Anet was fined for taking a wreck belonging to the crown. Stephen also wrote to holders of the name in Scotland, Ireland and several families in America, both Canada and the U.S.A. One of these families, the Annett’s of Gaspé, were particularly anxious to discover more of their ancestor William Edward Annett who settled in Gaspé in the l8th century and whom tradition had as emanating from Wessex. Research by Kenneth H. Annett established a very full family tree from William Edward right down to the present day. However, a firm link with the Annett family descended from Rolphe of Northumberland was not to be made until after Kenneth’s early work had been published in an interesting family chronicle. Stephen Annett’s work has been continued, not only on the family of Rolphe where he concentrated but on other families both Annett and Annetts. Much credit for work on the latter families is due to A.T.Neal and R.Annett, for their combined work has done much to bring together details on the major family groups descended from those Annetts of Wessex noted earlier. In the new millennium new workers in all parts of the world are continuing the work of these pioneers in the study of the Annett and Annetts families. As a Satirist, Annett is, to my thinking, far greater than Pope or even Byron. He was greater as a Man and his purpose, the greatest imaginable -to enlighten and free humanity from false faiths and fears. He did not waste his talents and energies in sneering and mud-slinging at insignificant individuals who annoyed him; he never indulged in spiteful petty animosities. He aimed his arrows with unerring accuracy of vision and aim at Superstition -the creeds of the Christian Churches -made up of myths, “magic and mysteries. He never missed his mark. Sometimes his attacks are scathingly vitriolic -so were Voltaire’s - and so, too, were the winged shafts of Lucian, the greatest satirist the world has ever known. Like Lucian, Annet devoted his genius to attacking the tyranny of superstition – the matured form of a parasitic growth that was in its infancy while Lucian was annihilating the old Greek gods. Like Lucian, Annet gave of his best to free humanity from fear and illusions and to promote human happiness. These letters have never been reprinted; they certainly afford a vivid and realistic presentation of Annet’s attractive personality, especially as they were confidential communications – written without any idea of future publication. “The late Mr. Peter Annet, who died a few days ago at Lambeth enjoyed the friendship of the late Archbishop of Canterbury for several years before His Grace’s death, insomuch that he left him an handsome annuity in his last will, and assured him that he took no part in the prosecution which was carried on against him, some years ago, for his Deistical writings, in consequence of which he had stood in the pillory. ‘Annet benefited for a very short time by Secker’s generosity, since the latter died towards the end of I768 and Peter died in January, I769 ‘. The one and twentith daie of February last past was robbed Bytwene Dover and the Coste of Normandy the ship named the Bonadventure, by John Marychuroh and William Toker englishmen, the whiche did Robb out of the same shipp 74 great ballatts and 30 lb peces of vitry canvas of all sortes, which was worth £900 sterling: And after the spoile was done the same piratte went to Laistof Road, And there did sell to Thomas .Annet of the same towne certeine quantitie of it: By all such meanes and crafte as shall appere by the confession of Thomas Burman his servante annexed hereunto: And after that the same was knowen were faine the merchantes at their great coste and charges to finde it, And there was founde 900 peces of vitry canvas cut and hole, and 80 peces of poldaves cut and hole As it doth appere by thindenture exhibited in the admirall Courte, And out of the same Canvas and Poldaves was cut a great deale to the value of above 140 pounds, for every pece: ought to conteine 75ells: The whiche the whole peces sholde be ….. ells, and there was delivered nomore than 4800 pounds As it doth also appeire by the above said indenture, And considering the premisses and who craftelie the said Annet (being a very substanciall Riche man) bought the said goodds, The merchantes requeste is that it wold please the Quenes majesties commissioners for these dauses to get the Quenes highenis .. …imediatlie uppon the sight thereof for to bring up the same Thomas Annet Thomas Burman and one Jagges which was consenting to the said piracie, And the matter to be examined afore them according to Justice, and to comand them to paie the same. Aboute twoo monethes past a shipp of Feckam coming out of Spain was robbed about the Cape by certeine Englishe piratts of these. parcells, 200 great hides of the Indeanes marked with read okar of this marke, N. D. foure butts of Spanish wyne marked with this mark . . 47 baggs of Read Allome marked with this mark C G.. All the said gooddes perteyning to the foresaide merchants amounting to £300. The 25th daie of May last past the shipp named the Noblet sayling from Nauntes to Bylbao in Spaine was taken by English piatts and carried awaie with all her lading; whiche was 316 fardells of lynnen cloth and habberdashery ware marked with divers markes amounting to above to the great undoing’of the poor merchantes, And the request of the same merchants doth desire that the Quenes majestie would write unto the Lordes of Skotland, that in case the same piratts and the same goodds may be stayed. That then it be done accordinglie, and not kept and mainteined there as they heretofore have done, And in like wise that worde may be sent to the Lorde deputie of Irelande for the apprehension staying, and making serches for the saide piratts and gooddes, And that the said Lord deputtie may send like worde throughe all the countrie and sea costes in Ireland: And in like wise that her majestie may give comandement to the lord of Darbie that he may send word to the Isle of man that in case there do arrive anie of the foresaid piratts that they may be stayed accordinglie: And in likewise the merchants do most humblie desire her majestie that they may have her graces comission thorow all the Realme, charging and comannding to assist the Bearers thereof in the makinge serche of the foresaid gooddes, And to staye them in whose landes soever it may be found, or that they maie understande that hath bought anie, That they maie appeire Before her graces counsaill to make answere according to Justice. P .R.O. Ref. S.P .I2/I7 X/J 8845. The examinatian of Thomas Burman servant to Thomas Annot of Leistoft taken by Sir Thomas Woodhouse knight the 28th. daie of Maye anno I56I. Upon this examination itt is required that Burman and Annot may be sent for. Item the said examinate sayeth further that as he went with the carte he did tourne one of the packes of canvas from the carte uppon the dewnes meaninge to have kept the same to his owne use whiche afterwarde his master understoode, and enforced this said examinate to deliver it unto him, And charged him that he should saie that he bought the same canvas of a kynsman of his at london, and charged him further .that he shoulde in no wise confesse the receipte of any of this canvas or of anythinge that might betraye the same neither to Syr Thomas Woodhouse upon any examination nor to any other man, And he wolde be good to him and that he wolde warrant him to save him harmeles / .